No. 1. I’ve spent most of the past week trying to weigh the good of Auburn’s BCS ranking against the bad. And there’s so much bad. The distraction. The swelled heads. The pressure. The amplification of the Iron Bowl to End All Iron Bowls hype that makes this weekend and our weekend with the Dawgs so much more dangerous. The target on the back. The iffy history of Auburn teams wearing a target of that size. If given a choice between No. 1 and No. 2 in this particular set of standings–where the latter is functionally identical to the former–I take No. 2 every single time. But the choice between No. 1 and No. 3 isn’t a choice at all. I never would have raised the possibility in this space, but like all of you I looked at Oregon’s schedule and Oklahoma’s schedule and Boise’s schedule and how pollsters were voting and had to wonder: We have to win out first. We have to win out first. And they’ve said it can’t happen again. But if we do win out … can it happen again? If Auburn wins out, it cannot. We know that now. Winning out remains a mountainous climb. But if Auburn makes it, they will be rewarded in the way the 2004 team was not. That’s more than enough good to outweigh even this much bad, and it’s not even close. An addendum. Some good news about Auburn’s chances of winning out that I meant to include in Sunday’s post: because of Newton, the four horses, the backs, and the ability of our wide receivers to block, I don’t think Auburn’s as susceptible to an upset as previous editions of the Tigers or other, more pass-centric teams. Throwing the ball is an inherently more variable, high-risk, high-reward strategy; it requires more precision, more timing, more good fortune when it comes to the quarterback position. We’ve all seen a red-hot quarterback win a game single-handed; we’ve all seen that same quarterback come back the next week ice-cold and lose the game single-handed. Obviously there’s going to be some variability in Auburn’s ability to block up front, in Malzahn’s skill in calling the game-plan, McCalebb’s ability to stay on his feet, etc. But Newton the runner is Newton the runner is Newton the runner. Judging from the line’s play ever since the Clemson disaster, there’s only so poorly they’re going to play. Dyer’s only gotten better as the season has progressed. All together, these days, 300 yards of rushing looks like the floor for Auburn’s ground game. And you’re not going to lose many football games rushing for 300 yards, are you? Doubt. It’s worth noting (are you paying attention, Auburn players?) that for all of the Newton hullaballoo and chatter about the Tigers being the SEC favorite, when you ask a national talking head to get right down to brass tacks, they’re still not buying Auburn as a national title contender. This roundup of the web’s bowl projections does show that there’s a lot of respect for Auburn–all four of them slot the Tigers into a BCS bowl. But they’re unanimous in declaring it either the Sugar or the Orange. None of them advance Auburn to the BCS title game. Two of them do, however, extend that courtesy to the Tide … and the ones that don’t are the ones that bump Auburn to the Orange in favor of moving the Tide to the Sugar. In other words: none of them expect Auburn to run the table. None of them expect Auburn to win in Tuscaloosa. You can’t entirely blame them given the deficiencies we know Auburn still has defensively, but … yeah, if Auburn feels like they’ve gotten enough respect by being moved to the BCS No. 1 and having the media falling over itself to give Newton his props, they’re wrong. Certainly there’s an excellent argument for Auburn to be No. 1. Their schedule is miles and miles ahead of Oregon’s. But the Ducks have been miles and miles more dominant. As much respect as I have for what our team has accomplished, I’d still like to see them whip a half-decent team just once (as Oregon has done a few times now) before giving them the top spot. De-fense, Auburn, de-fense. It’s not new (though it was when I started working on this post on, I think, Tuesday), but Jay Tate pulled a couple of game stills earlier this week to show how Ted Roof was changing up his looks last Saturday. 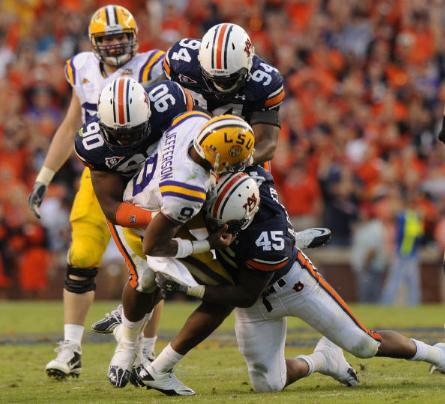 I didn’t give the Auburn defense a whole lot of credit (aside from Fairley, obviously) after the game, because I thought–and still do think, mostly–that an offense as hamstrung in the passing game as LSU’s is a bit of a lay-up. But I’ll say this: you can see Roof trying different things. He brings blitzes, ones that work an acceptably high percentage of the time. He changes coverages. He finds a way to stuff running games. I look at Auburn’s defensive lineup and I still can’t help but think they ought to be better than they are. (Why is Neiko Thorpe still playing dramatically worse than he did as a freshman?) But I also don’t think the problem is entirely Roof’s, either, and there’s no question that we saw a lot of improvement last Saturday. If we see even more this weekend, even after the Kentucky and Arkansas debacles, credit will have to be given where it’s due. R-E-S-P-E-C-T. Give it up for volleyball coach Wade Benson, folks, who took over one of Auburn’s worst athletic programs a few short seasons ago and already has them in position to win more SEC matches than they’ve done in more than a decade. More on Ole Miss later today. Why is Neiko Thorpe still playing dramatically worse than he did as a freshman? You might recall that he had a lot more help in the secondary back then and frankly his is just not that fast…or that seems to be the case since he get’s out-run on fly patterns pretty regularly. And of course he is now playing with a cast on his arm which might affect tackling. Just kidding, I think we’re doing fine. We’re not going to be LSU on D, but we (thankfully) don’t have to be, cause we’re !LSU on O. One thing that irks me is knowing this year’s team is ranked #1 while the superior 2004 team never was *because* there are no other teams that are *perceived* to be as good as the 2004 USC or OU teams were (pre-bowls). We honestly just lucked into having our “Cam Year” in the best possible year (other than 2007), just as we “un-lucked” into having the 04 team in 04, if you get what I mean.